I am a 17 year old female who tore her left ACL, MCL and meniscus in September 2009 when I was 16. It was in a soccer tournament showcase. I did a lunge to keep the ball from going out and the cleats under my shoes planted in the ground but my knee kept going forward and it came back into place. It was like a rubber band. The funny part today was that I said I would walk it off. HA! I had had very little knowledge of the knee at that time. For two months I did therapy about twice a week in preparation for the surgery. I had my surgery on December 10, 2009. I did the physical therapy 2 to 3 times a week but most of the work on range of motion I did was at the physical therapist's office. At home I usually did the exercises once a day although I should have done it twice or three times. My range of motion was "full" but I couldn't sit on my shins. (Those of you who have done this should know what I mean.) Eventually it came back but it was after a year. 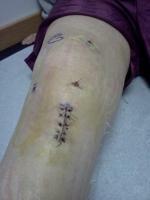 the procedure again and had my surgery on January 15, 2010. For the physical therapy, my mother chose a new therapist. But I only went for the first 3 times because I didn't want to put her through the trouble of going 2 to 3 times a week like before. And all of the exercises were the same anyway so I decided to do it at home. This time I focused on range of motion and I had it all back after only 3 or 4 months. In fact, it was still better than that of my left knee. I also did all of the leg lifts as well as a lot of walking and taking stairs when I could. However, I didn't do much of the resistance training which I deeply regret now, and again I usually did it once or twice a day. I also iced it about twice a week to reduce swelling. Now it is July 2011 and my knee still feels unstable. I have been jogging for a few months but I can't sprint. I really want to go back to playing soccer! I was going to play in college but the way it feels now, I know that the chances of me tearing my right ACL or MCL is very high. Is it possible to have a reconstruction again and "start from scratch"? Recently, I've been doing lunges and I now on all four sides of my thigh muscles. PLEASE!! What can I do?! HOW CAN I MAKE BOTH KNEES STRONGER?!?! I NEED to play competitive soccer again!